Despite a relatively low voter turnout, preliminary results show that the mayors of Jerusalem, Tel Aviv and Haifa have been re-elected. Despite a relatively low voter turnout in Israel’s municipal elections, preliminary results have found that the mayors of Israel’s three largest cities - Jerusalem, Tel Aviv and Haifa - have been re-elected for another five years. In Jerusalem, Nir Barkat polled 51% of votes in Jerusalem defeating Moshe Lion who received 45% of votes. Lion was supported by Yisrael Beytenu chairman MK Avigdor Lieberman and Shas chairman MK Aryeh Deri. The voter turnout at hareidi-religious neighborhoods in Jerusalem was about 70% and in secular neighborhoods it was about 30-50%. The voter turnout among Arab residents of eastern Jerusalem, who regularly boycott elections, was only 0.5%. "The elections weren't easy," Barkat said in his victory speech, "it was a long and difficult race, but tonight, the residents [of Jerusalem] have given us the mandate to take the city forward with the same vision for another five years." "More than ten years ago, my wife and I decided to place all of our business interests aside and focus on one thing – how to turn Jerusalem into an attractive place for young people. For visitors, investors and businesses - and we've proved that it has been possible for this change to take place," Barkat said, adding "there is much more work to do, we've heard criticism and heard the needs, it has all registered won't be forgotten." In Tel Aviv, Huldai received 53% of the votes, while his main rival, MK Nitzan Horowitz (Meretz), received 38%. A third mayoral candidate, Aharon Maduel, received 8.76%. In Haifa, incumbent mayor Yona Yahav defeated Yaakov Borovoski. In Be'er Sheva, incumbent mayor Rubik Danilovitch was re-elected with 42.97% of votes. In Sderot, Alon Davidi, who enjoyed the support of the Likud-Yisrael Beytenu, Labor, and Bayit Yehudi parties, was elected mayor, replacing David Buskila. In Beit Shemesh, incumbent mayor hareidi-religious Moshe Abutbul fought off the challenge Eli Cohen in a closely fought battle for the city that has been fraught with religious- secular tensions. In Lod, Likud candidate Yair Revivo defeated former Labor MK Yoram Marciano. In Ramat Gan, candidate Yisrael Singer defeated former Likud MK Carmel Shama Hacohen. Incumbent Shlomi Lachiani is leading in the count in Bat Yam, despite the legal problems he has been facing over the last few days. On Sunday, just two days before the election, the Supreme Court ordered Lachiani to resign because of suspicions of corruption, but allowed him to run for re-election. In Ra'anana former mayor, Jewish Agency head and Kadima MK Ze'ev Bielski has defeated incumbent Nahum Hoferi. Longtime Netanya mayor Miriam Feirberg is stormed to a fourth straight election victory with 80% of votes. Likud candidate Haim Bibas is leading in the city of Modiin. In the hareidi-religious city of Elad, Rabbi Yisrael Porush who was supported by the United Torah Judaism party has defeated Shas candidate Tzuriel Krispel. In Efrat, incumbent mayor Oded Revivi won a second term in office by a majority of 63%. The incumbent mayor of Maaleh Adumim, Benny Kashriel, has been re-elected. In Kiryat Arba, incumbent mayor Malachi Levinger has been re-elected. In Kiryat Malachi, Bayit Yehudi candidate Lalo Zohar was elected mayor. Current mayor Uri Ohad has been reelected in Petach Tikvah. Hanoch Zibert polled 94% of votes in Bnei Brak. A second round of votes is likely in Herzliya where all three main candidiates, Yonaran Yasoar, Tzvika Hadar and Moshe Padlon scored just over 20% of votes. According to the most recent count, Ashkelon is expecting a change of hands as Itamar Shimoni looks to have unseated incumbent Benny Vaknin. Nahariya mayor Jacky Sebag looks to have been re-elected. In Kiryat Ata, current mayor Yaakov Peretz was victorious. Asaf Mintzer and Ariel Granit are also expected to face a second round in a closely fought election in Elkana. 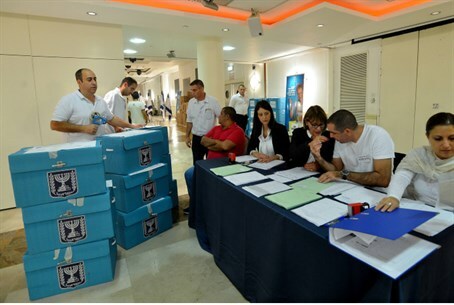 Voter turnout rates were highest in hareidi-religious cities, including Bnei Brak, Elad and Kiryat Sefer, with high turnouts in Arab cities also reported.